Looking for a fun Christmas present for yourself this year? 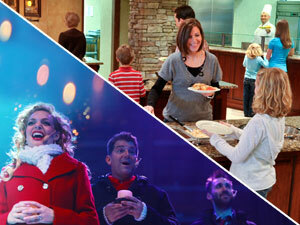 How about a day out that includes a great show and a great meal for only $49.50 per person! Come see our all-new 2013 Christmas Show: The First Noel on Saturday, December 14 or December 21,* then visit our friends at Hershey Farm Restaurant for a scrumptious lunch. Start your day with a 10:30 a.m. performance of our critically-acclaimed Christmas Show, featuring your favorite seasonal and sacred Christmas songs, brought to life on stage by our talented singers, dancers and live orchestra. Then, head over to Hershey Farm Restaurant for their Grand Smorgasbord, featuring both classic PA Dutch dishes and modern favorites, hot entrees, daily specials, a Soup, Salad, Gourmet Bread & Potato Bar and deluxe dessert bar. After lunch, you could enjoy the great shopping options at the nearby outlets, or visit some of our many Lancaster County attractions. Packages are limited for this special Saturday offer, so don’t delay! Stop by the Box Office or call us at 800-648-4102. Please use code HERSHEY when ordering. This holiday season, treat yourself to a great day out with Hershey Farm and AMT! *Offer available 12/14/13 and 12/21/13, 10:30 a.m. performance only. Valid for up to four adult show tickets/lunches. New orders only; based on availability; while supplies last. Cannot be combined with other offers; service fees apply. Must mention code HERSHEY at time of purchase. Offer includes Christmas Show ticket, Grand Smorgasbord meal, non-alcoholic beverages, and tax. Gratuity not included. Offer not available online.